We have been traveling to the Mayan Riviera since 1998 annually, if not more often. I thought it would be fun to look back and share some of our favorites. What’s fascinating about this area is it is home to some of the fastest growing places in the world, as well as to places where time seems to stand still. We will highlight some of our favorite places to stay, eat and things to see and do will be follow up articles. We have stayed in Cancun and have found it is not our favorite. I know it is a place many people love, but to us it really isn’t that different from Myrtle Beach. Cancun does have the beach but it is mostly large all-inclusives, which are not our cup of tea. We believe if you are going to travel and really get a feel for where you are you need to go local and support smaller businesses. If you just want to lay in the sun, be waited on and never leave a resort there are plenty of those places to find in Cancun, and along the Riviera Maya coast, we just tend to avoid them. If your trip is short and you want to stay close to the Cancun Airport I would suggest Puerto Morelos. I have enjoyed several places there and find I am intrigued with the number of Airbnb spots that are available for future visits. It is about 20 minutes south of the airport, but is home to a protected beach, and still has much of the feel of a diverse fishing village. My last trip I stayed at Hotel Hacienda Morelos. If you are looking for a reasonably priced beachside hotel, no frills but clean with a good restaurant and a pool this is your place. The entry way is lovely, like walking into a real hacienda, but it opens up onto a patio overlooking the beach. You are steps away from one of the nicest beaches and fishing villages. If you don’t mind being a few streets back from the beach, I would recommend a lovely B&B, Casa Caribe, which is also home to a small cooking school. Close to everything, this is a clean, charming place and the owner is so delightful. If you have the chance you will enjoy hearing all about Puerto Morelos from her. Traveling south you will enter Playa Del Carmen. There is no place I have been to that has changed more over the past 20 years. My first visit was on my way to Xel-Ha in 198; it was still mostly dirt roads and a very unimpressive fishing village, known more for its ferry to Cozumel. Over the years I have stayed here in a number of beachside resorts and small hotels, many of which are now gone, taken over by large all-inclusives. I still do enjoy Playa because now there is a real vibrant city where the dirt roads used to be, but I find I prefer not to stay here. The place that is my home away from home is Akumal. 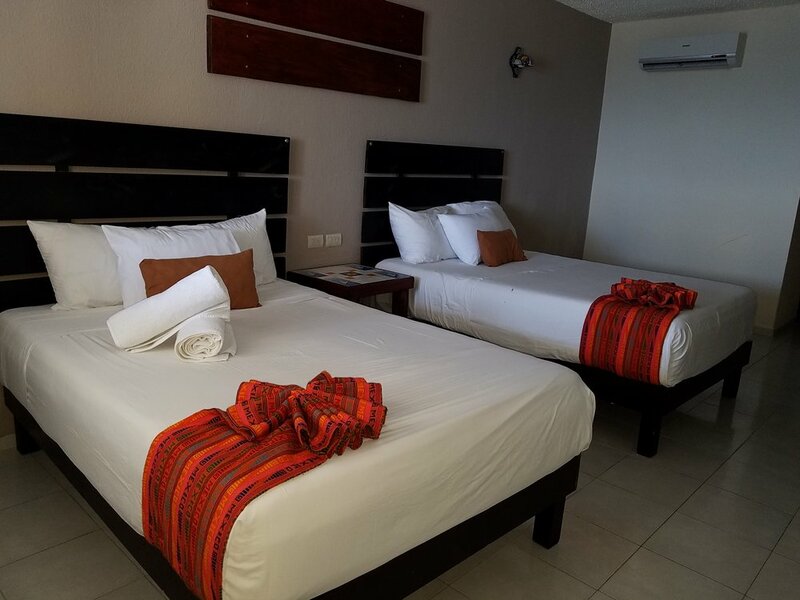 I have stayed in a number of hotel rooms, condos and luxurious villas here but, the place I return to most often is Hotel Akumal Caribe. Though Akumal has changed over the years, because of its lay-out, there is only so much room for growth. Thank God! Hotel Akumal was the first resort on the coast and is still owned and operated by the same family, which I am pleased to call friends. They operate a wonderful business and are known for giving back to the community in a number of ways, including but not limited to hosting many fundraisers over the years. They also have done so much to help make their property eco-friendly, and their efforts don’t stop there, they helped start a coral restoration project and on the weekends spend their free time hunting lionfish, which is an invasive species of fish wreaking havoc on the local reef. When traveling with a larger group I have enjoyed some of Hotel Akumal Caribe’s sister properties which include the Canon House located out on the point, Taj Kuumal located between the hotel and the Canon House and the 4 great villas at Villas Flamingo on Half Moon Bay. Looking for a really reasonable way to stay in Akumal check out Mangrove Inn, a renovated property across the street from Villas Flamingo on Half Moon Bay. It offers the options of private rooms, studio apartments with kitchenette and a co-ed dormitory. Further south is Tulum. Our favorite place in this area for many years was a magical bed and breakfast on the road to Coba named La Selva Mariposa. Our dear friends Lou and Moe used to own and operate it and we have not been back since they left. It is a very unique property, but what we loved the most was the wonderful stories and times we spent with Moe and Lou. We are a little concerned, that without them without them, some of the magic will be gone. But the property is so wonderful and different that I’d still advise checking it out. If the jungle setting is not what you are looking for and you want to splurge on an amazing beachfront location in Tulum, we say stay at The Beach Tulum, it is an incredible location and the rooms have every imaginable detail, including private rooftop jacuzzis! And next door you will love Ziggy’s restaurant. If money is no option, this is a pleaser! Continuing south, we love Laguna Bacalar. The lake is known for its seven shades of blue and we love the way it seems to have never changed over the years. It’s a peaceful, quiet destination. If waterfront is a must we recommend the very art deco appeal of Hotel Laguna Bacalar. You will feel like you have entered a time warp that takes you back to the 1950s. Built on a hillside, it has a unusual lay-out with a fabulous history, good restaurant and nice pool. Looking for something a little more modern, a block or two from the beach, closer to town is Aires. We loved this place. The views from the rooftop and the top floor rooms are amazing. They offer a great breakfast and it is just a short walk to the beach, fort, shops and restaurants. The staff here are wonderful, they took good care of my husband when he fell ill and also couldn’t have been more helpful with their concierge service making tour recommendations and reservations when needed. Heading back to the beach, the Costa Maya is home to Mahahual and Xcalak, which are two delightful but very different towns. Mahahual is a sleepy town unless the cruise ships are in town and then it can be full of people. Xcalak is a town lost in time. We have gone 10 years between visits and it seemed exactly the same. In Mahahual, we have enjoyed several stays at Balamku, a wonderful Bed and Breakfast on a quiet bay south of the town . In Xcalak, we stayed many times at Casa Carolina, but like our friends at Las Selva Mariposa, the owners Caroline and Bob have recently sold their property and moved back to the states to be closer to grandbabies. Their property has been renamed Casa Paraiso, but the location is still the same and that is priceless. If you are really in the mood to add an adventure to your trip we highly recommend you leave the coast at this point and travel inland to Calakmul. There is an amazing small resort located off the main road on the way to the ruins, Puerta Calakmul. In some ways it may seem more like “glamping” but, believe me, it is one of the most uniquely magical places I have ever been. And the attention to detail is quite extraordinary, given it is literally in the middle of nowhere. It’s a place the howler monkeys will serenade you at night. It also has a restaurant with the most beautiful hand-carved dining tables. It is out of the way but also very much out of this world. What was most wonderful about my trip was how close we got to the birds, howler and spider monkeys. Best of all, we even a jaguar on our visit to the ruins. If you have time to explore I would recommend trying every one of these places on your next adventure to Mexico. The other side of the Yucatan is just as appealing, but that is another story for another day!